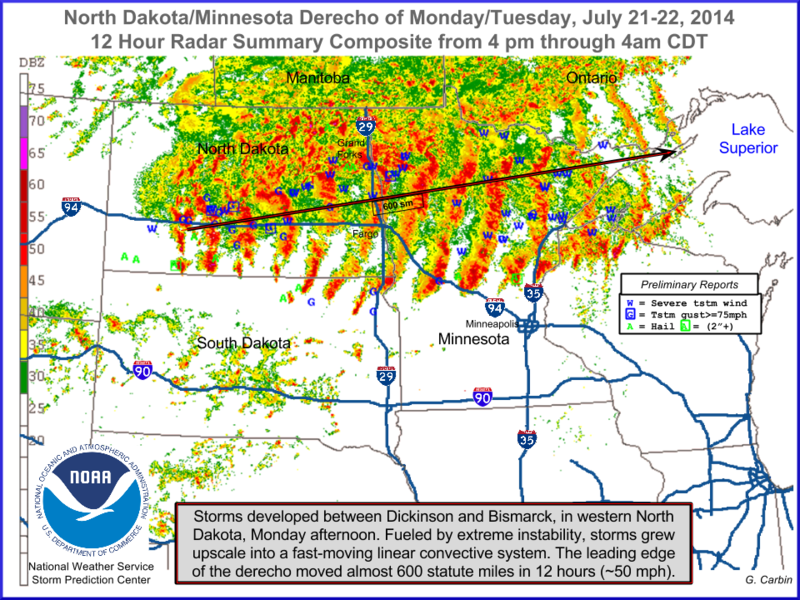 On Monday, July 21, 2014, during the late afternoon and evening hours, a severe weather event moved across North Dakota. 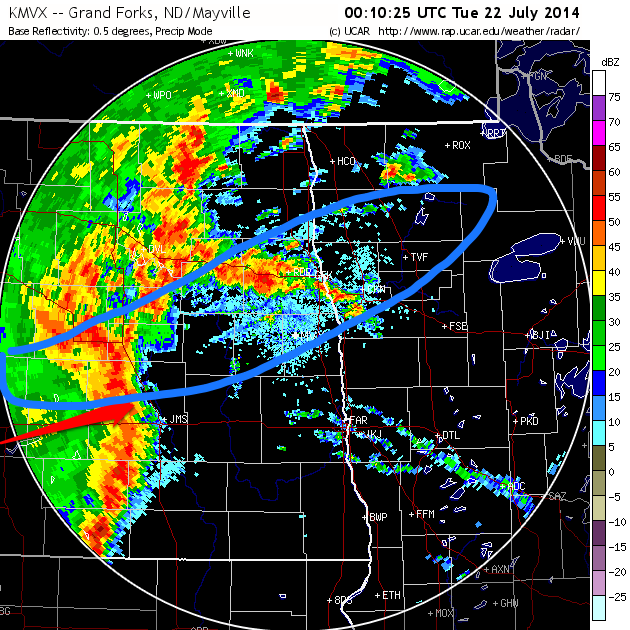 Below is the radar summaries of the storm from both the WSR-88D in Bismarck and Mayville, North Dakota. Summary Radar from the strong severe weather wind event of July 21-22, 2014 from the Storm Prediction Center. The line of thunderstorms that moved through across the state produced mainly wind damage as symbolized on the graphic below with a blue “W”. The green “H” symbols represent hail reports 1″ or larger and the “T” represents the one tornado report from this event. 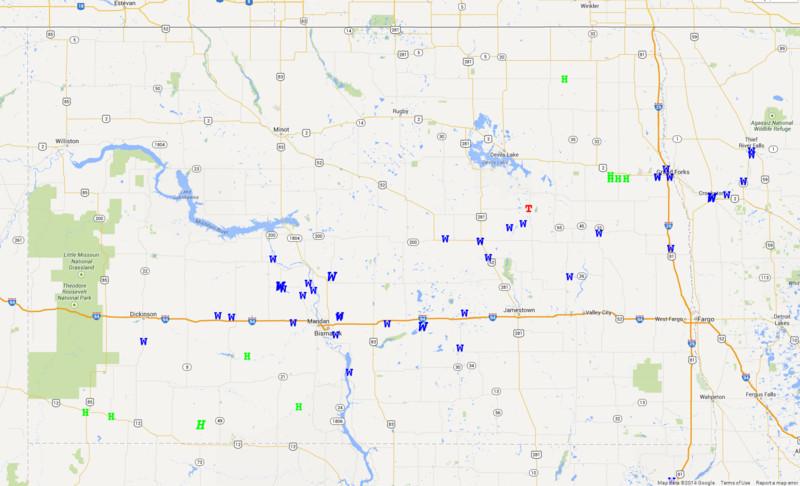 Storm Reports for July 21, 2014 in North Dakota via the Storm Prediction Center. 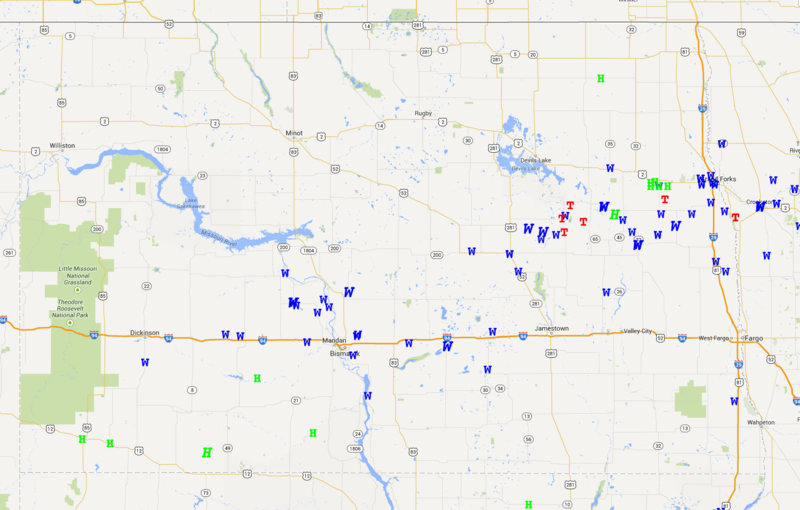 The NDAWN (North Dakota Agricultural Weather Network) with multiple sensors in the state of North Dakota and western Minnesota was able to in near real time show the motion of the strong straight wind ahead of the line of thunderstorms move across the area. Below is the peak wind gust each hour as the storms moved from the southwestern portion of North Dakota into the northeastern part of the state then into northern Minnesota. The strong wind from 1500 CST (4:00 PM Central Daylight Time) to 21:00 CST (10:00 PM CDT) was associated with a gust front, the strong wind on the leading each of the line of thunderstorms. Animation of Peak Wind Gusts for the evening of July 22, 2014. If you examine the radar animations above, you will notice the radar signature taking on a bow, or a boomerang shape. That is a sign of strong mid-level wind descending along the line of thunderstorms. In the example below there is an arrow representing the bowing of the line and the enclosed blue area representing the area with the strongest wind. 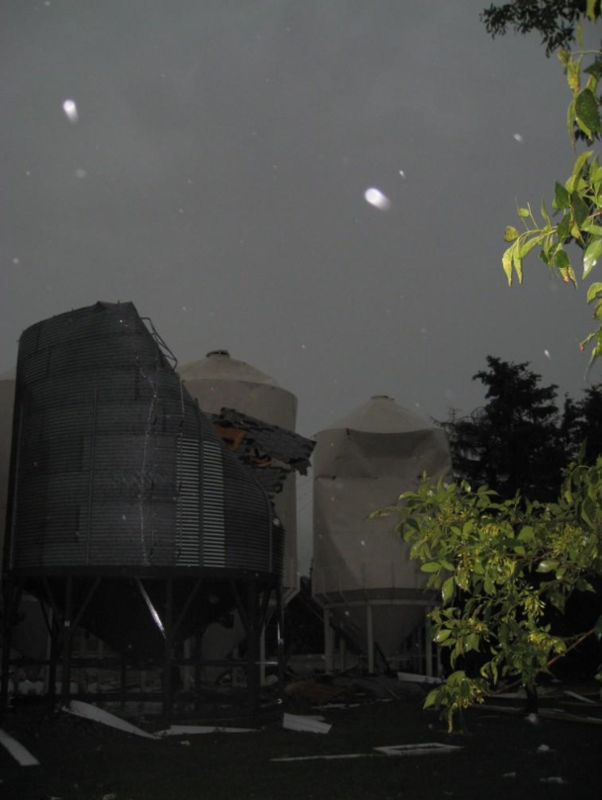 Often, there is also wind damage on the southern flank of the storm line as well, but with this event that was not the case. 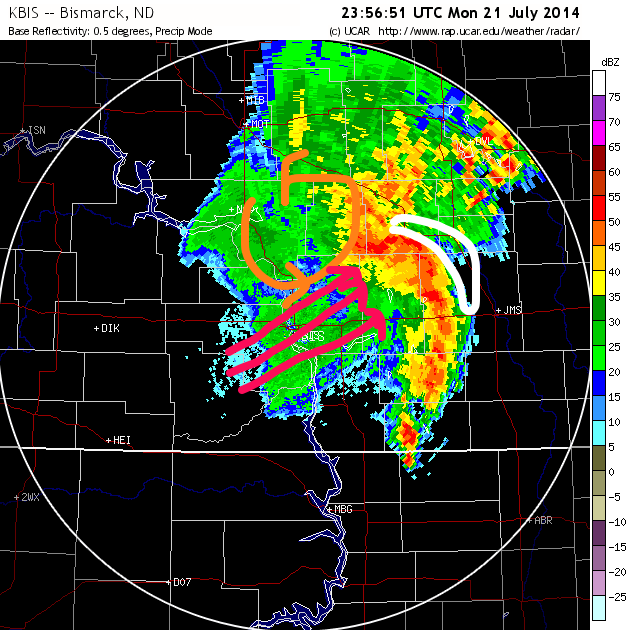 One reason for the lack of strong wind on the southern flake of the bow echo was the strong wind was concentrated on the northern end of the bow as a meso-scale convective vortex (MCV) formed with this system. There was small (meso) circulation that developed to the north of the bow. This counter-clockwise circulation and associated raising motion, “pulls” wind into the circulation. In this case this enhanced the wind and caused strong down-bursting wind on the southern edge of the MCV. The red arrows represent this wind aloft, the the surface wind would be felt in the white enclosed area. 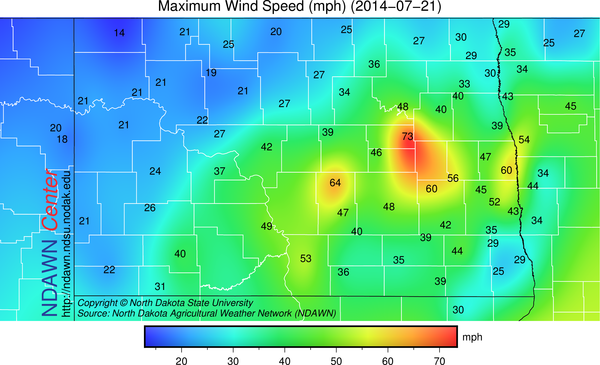 The highest wind speed from the event, at the NDAWN sites is presented below. This corresponds well to the storm reports in the previous graphic. Not only was wind a problem from this event, but the MCV on a very localized scale, has the same deformation zone of a more traditional mid-latitude cyclone (low pressure system). Often times these areas are referenced as “wrap-around” rain (or snow in the winter time) areas. So near and just north of the center of the MCV was a narrow band of heavier rainfall. 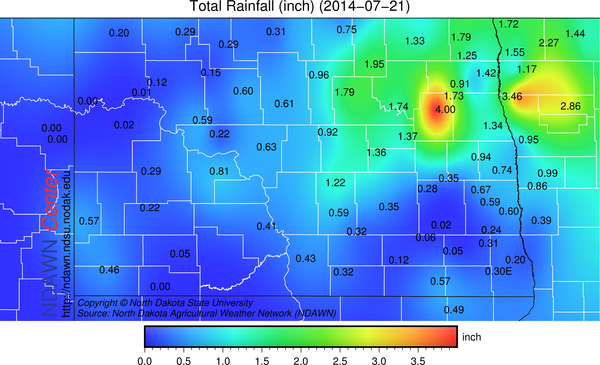 Total rain fall exceeded 3 inches in some locations. 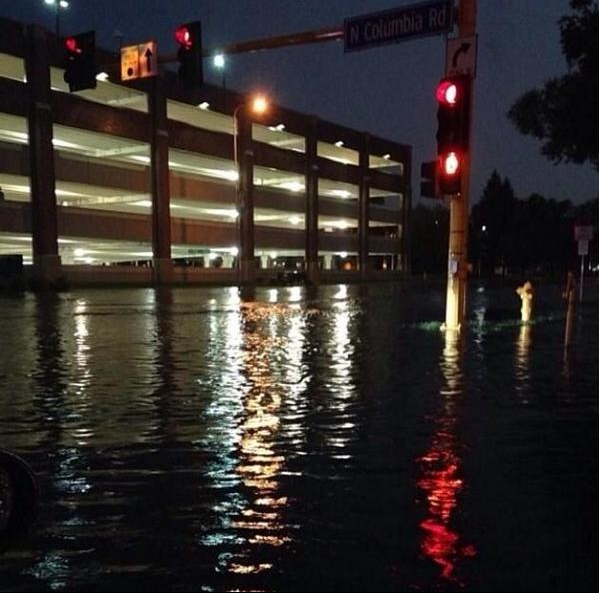 Extensive street flooding was recorded in Grand Forks where the National Weather Service Office recorded 2.74 inches of rain. 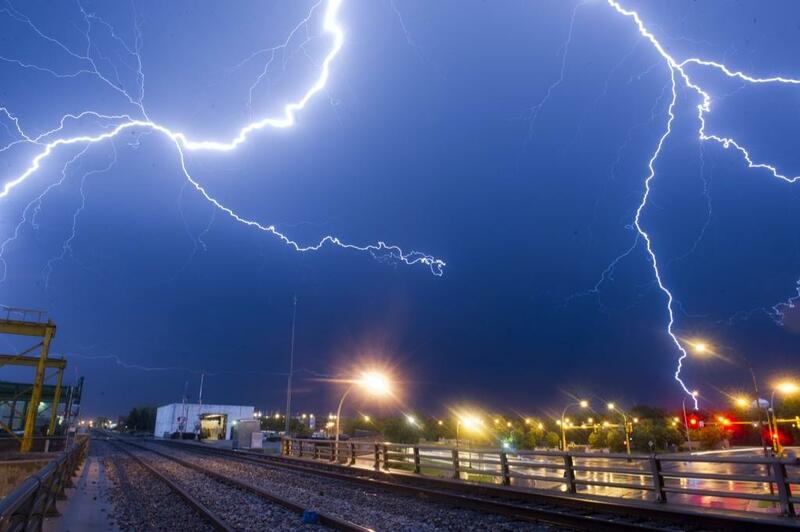 It was no where near the largest severe weather outbreak in the area. 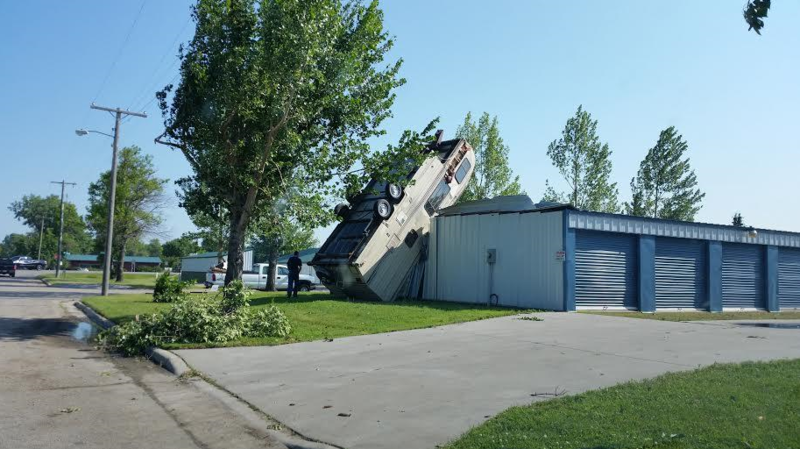 In many ways, a typical summer event for the climate of North Dakota, yet, it was the most significant, or at least most widespread event of what has been a fairly quiet summer of severe weather in the area.